Despite a long week, Lisa being chatty and Shelly just not feeling it, we got together to do another video talking about some feedback we received from our Easter video. 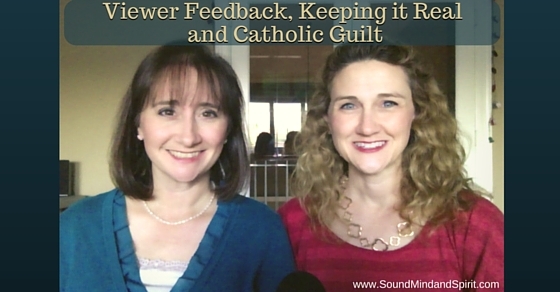 Watch to hear the feedback where a friend asks us about Catholic Guilt and Keeping it Real. If you're not familiar with "Catholic Guilt," it's that feeling of not being "perfect enough" or "holy enough." We talk about being late to Mass, not being good enough, how it's great to have expectations, but the reality of life is.... well life! We're wondering if our culture celebrates being busy - is it a competition on who can be the busiest? Our question to you: How do you struggle with the every day and how you thing things should be versus the reality of our messy lives? Oh, and watch out for a very unexpected photobomb!